It’s all about the Ducato – when it comes to the base vehicle! The Italian-built Fiat Ducato wins the title of favourite motorhome base vehicle as we reveal the results of our latest community poll. The Ducato is the base for around three quarters of the European and UK motorhome market and is loved by many for its firm ride and well equipped cab. There were 359 votes cast and more than a third (36%) voted it as their favourite – making the Fiat Ducato the outright winner. The Ducato has formed the basis of a wide assortment of motorhomes, from panel van conversions, to traditional coachbuilt vehicles and A-class. 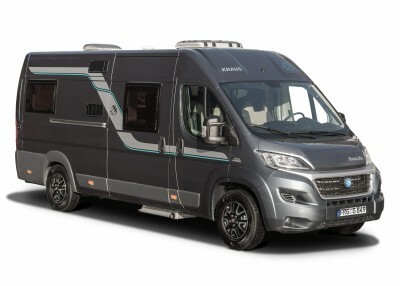 It was also highlighted in this year’s Motorhome of the Year (MMM and Which Motorhome) – the Knuas Boxlife 600 – which is based on the long wheelbase Fiat Ducato panel van. We featured the Knaus Boxlife 630 in August last year. Neal Miller said the Fiat Ducato with Euro 5 engine gave “smooth and punchy driving” and John said although it’s never going to be a sporty drive the Comfortmatic gearboxes are “relaxed”. He likes the ‘hilly’ mode as well as the little extras such as USB charger, worksheet clip, tablet computer holder and has experienced brilliant customer service. Andrew Harcourt’s favourite is the 1993-95 Fiat Ducato for its simplicity and economic driving – although he does have a new one! Also built in the same factory as the Ducato, the Peugeot Boxer came in second with 18 percent of the votes, closely followed by the Mercedes Sprinter with 16 per cent. The Sprinter got the vote from Ray and ‘Dun cruising’. “It’s always been a good reliable motor. It’s got great pulling power and is very economical,” said Ray. Clive agrees that the Mercedes Sprinter 518 is a “super smooth motor”. “It does add cost to the motorhome to have a Mercedes base vehicle but with rear wheel drive and the bulletproof V6 engine it makes the perfect motorhome base in my view,” he commented. The Ford Transit wasn’t too far behind with 14 per cent of the votes and it’s the base vehicle of choice for John Roberts. 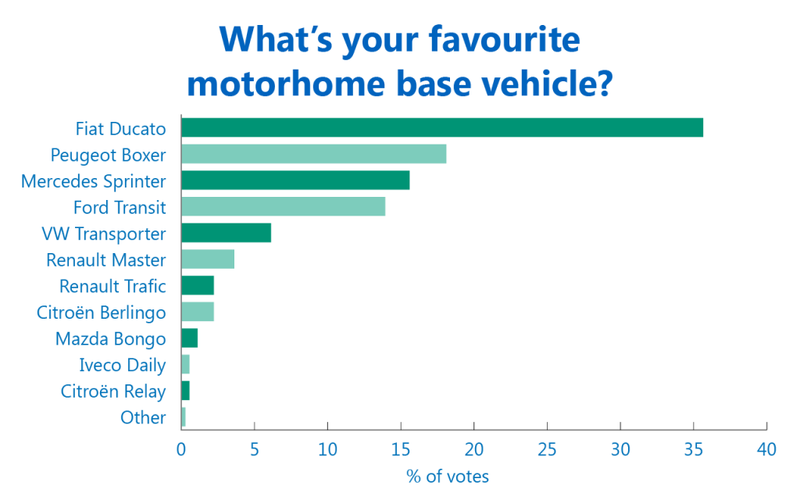 75% of all the motorhomes out there are Fiats yet they only got 36% of the votes. That surely makes Fiat a big loser. The brands whose proportion of the votes were greater than their market share are the real winners. That probably makes Mercedes and Ford looking good. I have driven vans all my driving life, (50yrs), we have very little choice as to the chassis as the conversion manufacturers choose for us, more than likely cost, my van is a 2011 Ducato 10000 miles and compared to other commercial vehicles I have driven It’s an old dog, gear change poor, torque steer awful and it’s noisy, but has sufficient power as most modern engines would have & how long will these poor quality switches last. BUT we brought it second hand at a good price so it will do, as the rest of the van is perfect for us. Me a Transit, Mercedes/ VW rear wheel drive any day youpays your money. Chausson offer both Fiat Ducato and Ford Transit . I have had a Chausson Best of 10 on the Ford Transit for 2 years, it now done over 12,000 miles with no faults from the Ford Transit. Do you know of any manufacturer that offers you a choice of the base vehicle of your own choice ? I suspect the Ducato wins hands down as it is the first choice for most manufacturers and out numbers all the others.